What happen(ed) when artists annex(ed) an island? 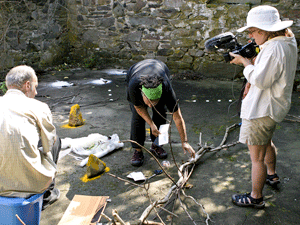 This summer Alice Apley and I were “embedded documentarians” collaborating with mixed-media artist Sharon Haggins Dunn on her installation, Dragonflies and Angel Wings as part of the 2009 Bumpkin Island Art Encampment. An exhibition opens this weekend (part of the Fort Point Open Studios in Boston) documenting the encampment and runs through October 31st. Alice’s documentary (a 12 minute cut of what will eventually be a 30 minute piece) and my night photographs will be on display. Alice and I will be at the public reception with curators and artists, October 18th from 6 to 8 p.m. The exhibition takes place at Studio Soto at Thompson Design Group, 35 Channel Center St, Boston, MA 02210. More details including gallery hours are available on the Berwick Institute site at www.berwickinstitute.org/bri/bumpkinisland.